The HIAPER Pole-to-Pole Observations (HIPPO) project is investigating the Carbon Cycle and greenhouse gases throughout various altitudes of the western hemisphere through the annual cycle. HIPPO is supported by the National Science Foundation (NSF) and its operations are managed by the Earth Observing Laboratory (EOL) of the National Center for Atmospheric Research (NCAR). Its base of operations is EOL's Research Aviation Facility (RAF) at the Rocky Mountain Metropolitan Airport (RMMA) in Jefferson County, Colorado. The main goal of this program is to determine the global distribution of carbon dioxide and other trace atmospheric gases by sampling at various altitudes and latitudes in the Pacific Basin. The “Collaborative Research: HIAPER Pole-to-Pole Observations (HIPPO) of Carbon Cycle and Greenhouse Gases Study” will measure cross sections of atmospheric concentrations approximately pole-to-pole, from the surface to the tropopause, 4-6 times during different seasons over a 2.5 to 3-year period. A comprehensive suite of tracers of the Carbon Cycle and related species will be measured: CO2, O2:N2 ratio, CH4, CO, N2O, 13CO2:12CO2, H2, SF6, COS, CFCs, HFCs, HCFCs, and selected hydrocarbons. HIPPO will transect the mid-Pacific ocean. The program will provide the first comprehensive, global survey of atmospheric trace gases, covering the full troposphere in all seasons and multiple years. 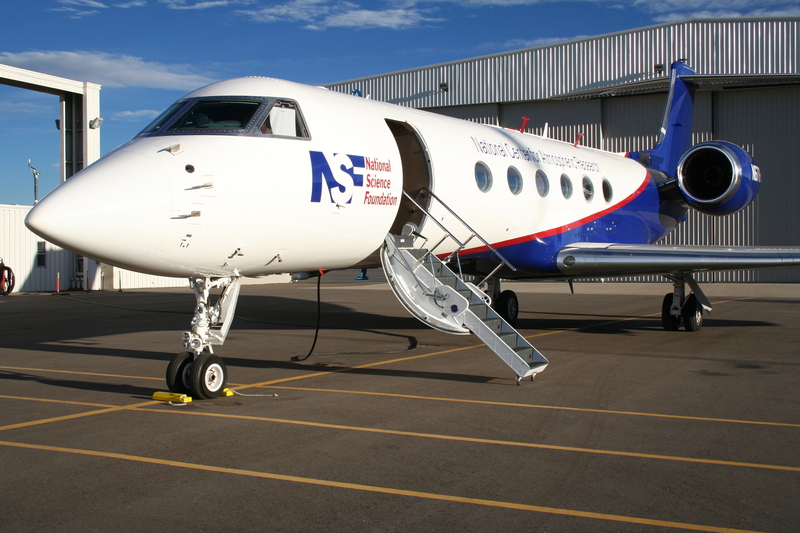 The research will be conducted by a 10-person team aboard HIAPER, a modified Gulfstream V (GV) aircraft that was designed and developed by the NSF for high altitude observing and advanced research. The research will take place over five missions, each lasting approximately 28 days, traveling over 30,000 miles per mission, sampling atmospheric gases from sea level up to 47,000 feet. Scientists continually monitor the 24 instruments included in the GV aircraft during each flight. Many of the instruments are fixed to the under-side of each wing, along with cameras, regularly sampling the surrounding atmosphere during flight. Atmospheric pressure, temperature, wind speed, aerosols, water vapor and chemical composition are studied to create a “snapshot” of Earth’s atmosphere. Please see Frequently Asked Questions for a list of more detailed questions about the HIPPO project. This HIPPO site is maintained by the National Center for Atmospheric Research (NCAR) Earth Observing Laboratory (EOL). EOL is a laboratory within the National Center for Atmospheric Research. NCAR is managed by the University Corporation for Atmospheric Research under sponsorship by the National Science Foundation. Any opinions, findings and conclusions or recommendations expressed in this page are those of the authors(s) and do not necessarily reflect the views of the National Science Foundation.